I decided to purchase a silvertip knot and 2-band knot from Envy Shave before I had received the DFS LE synthetic I ordered, and didn't get around to installing them into a handle until just today. Already have had a chance to use my fabulous DFS LE synethic, but I'll be just as glad when I get to use these all! The P8 handle is one I purchased from Rudy Vey with a 26mm Romera Premium Silvertip knot, the middle is a Whipped Dog goblet handle with a 22mm Envy Shave silvertip knot, and the last is a Whipped Dog amber tall handle with a 22mm Envy White supreme badger knot. I'm not usually a fan of most knots you can buy, but Nathan's looked superb, and they feel great in person, and I suspect they'll perform every bit as good as I think they will! Did the tall amber handle take the 22mm Envy White without modification? yes, the tall amber handle had no problems at all as it was a 24mm handle. My first one I requested the handle to be drilled down too low. The hole measures about 25.5mm in diameter. I could've used that for the Romera knot but it would've required sanding down as well. 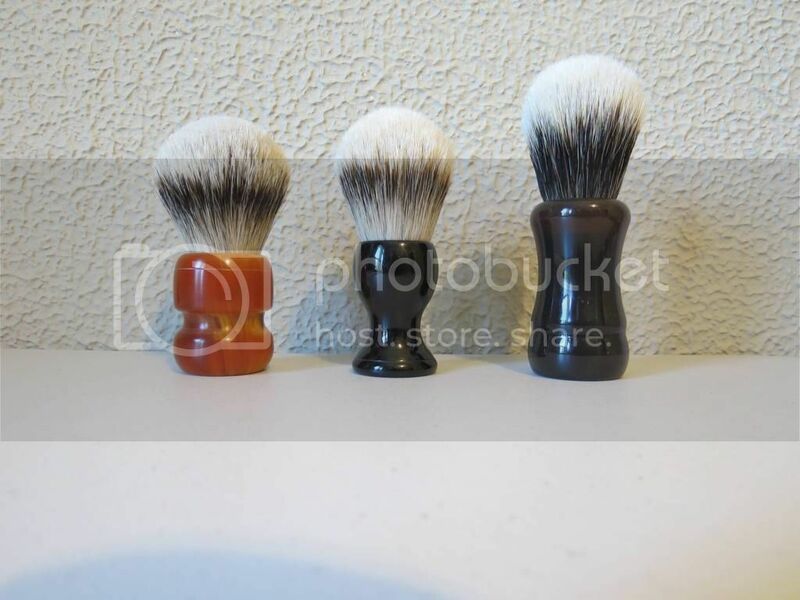 A great set of brushes. Looking forward to your impressions after you have the opportunity to put them through some shaves.